I started with a recipe I tried a few years ago for baby back ribs. I remembered that they were really tender, but also felt like there were a lot of steps. Using this recipe as a guide, I made some changes to better suit our tastes and to simplify it a bit. I made two different sets of ribs, one for the child who hates all things spicy (salt, sugar, and ketchup only), and one set for the child who loves a touch of heat (peppery spice blend, sugar, BBQ sauce). Both were good, but I preferred the peppery version. The other big change to note is that I used Pork Loin Back Ribs instead of Baby Back Ribs. I prefer the Pork Loin Back Ribs because they are meatier, with thicker chunks of meat on top of the bone. The braising method makes the pork fall-off-the-bone tender, which is good for me because I hate gnawing on a rib like a caveman. I like to look like a lady; a lady who really likes ribs. When I made ribs this week, I was banking on baseball being cancelled due to rain. The weather held out that night, and we did not have time to eat the dinner I had planned. Instead of trying to cram in the tasty meal, I left them wrapped up and finished them with sauce the following night. They were perfect. I would highly recommend making these a day ahead, and finishing them to serve the next night. These would be perfect for a crowd, as it would be just as easy to double or triple the recipe for more guests (or hungrier guests). Decide which spice blend option you prefer, then mix together the brown sugar and salt or pepper blend. Divide the mixture evenly between each of the racks of ribs, sprinkle on top and lightly rub into the meat. Completely wrap the rack of ribs in foil, leaving one end rolled for easy access later. Place the foil-wrapped racks in the refrigerator for at least 1 hour. In a small container, mix together the wine, vinegar, Worcestershire, and ketchup. 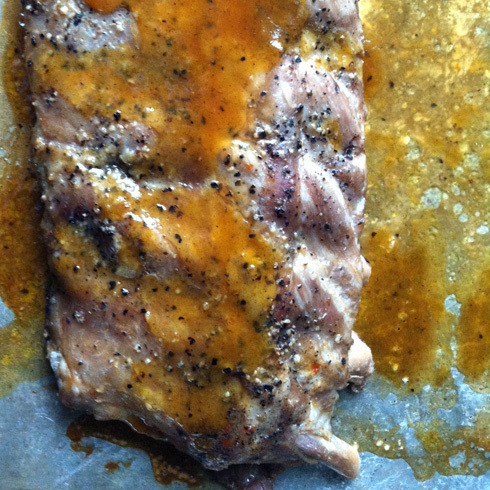 Place the ribs on a rimmed baking sheet. Gently open one end of each of the foil packs and pour in some of the liquid. Divide the liquid pretty evenly between each of the foil packets, then seal it back up. Place the tray of ribs in the oven and cook for 2 hours. If you are ready to serve, remove the ribs from the foil and return to the baking tray. Top with the ketchup or BBQ sauce (depending on which Option you chose above) and spread it around a bit. Increase oven temperature to 350° F, return ribs to oven, and cook for 15 minutes. If you are making ahead, leave the ribs in the foil packets and refrigerate until you are almost ready to serve. Place the wrapped ribs in the oven at 200 degrees and reheat for 30 minutes. Top with ketchup or BBQ sauce and spread around a bit. Increase oven temperature to 350° F, return ribs to oven, and cook for 15 minutes.